I've actually managed to keep mum about this project for 2 months now! I had knitted these up during that company camping trip with Brett and the Munchkin back in September. 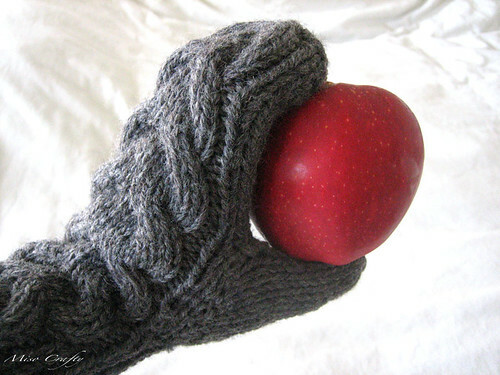 These mittens were a very easy and such a fast knit! It was my first time using the Magic Loop Method, and I must say, it really is magical! At first I was having a wee bit of a hard time, but after a few rows I got the hang of it and once there was some weight to the project the knitting part got better. I also think the cable on my circulars were the main reason why I was having issues. I was using the cheapo Red Heart brand needles (bought when I first starting knitting seriously and didn't know any better) and the cable was annoyingly thick and über stiff to the max. It took about 20-30 rows before the cable became somewhat pliable enough to use more easily. I used a double strand of Patons Classic Wool Merino to get the chunky yarn effect. I simply love working with Patons Classic Wool, it's so versatile and easy to use. I used 2 skeins but in the end I still had about under a half a skein each left over. Not sure if it's enough to make another pair of mittens though. Oh well. Since I was doing the double strand on a smaller needle size the cable work made my hands a little sore every now and then. I've never done horseshoe cables before, so I was a wee bit intimidated to do them. 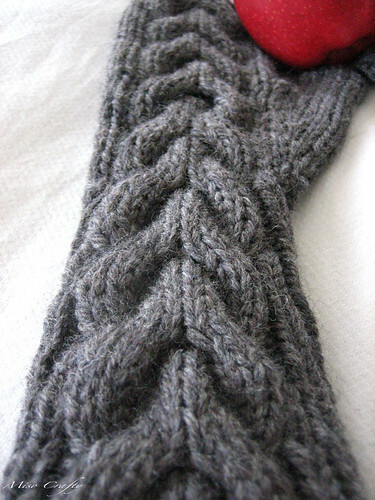 After I completed the first cable pattern I was completely gobsmacked as to how easy it was! There was no need at all to be intimidated! So how fast did these mittens work up? Well I had knitted about 7-8 rows before the trip and by the time I got back home, I had 1 mitten completed - minus the thumb (stupid me forgot to bring DPNs with me! ), and had 3/4 of the other mitten done. I had never knitted up thumbs in the round before, but they had knitted up in a jiff! Again, I was surprised as to how easy they were to do! I highly recommend the pattern, it is written so well that I didn't have a single snag or left wondering what the designer had meant to say in a sequence. Everything was absolutely crystal clear. I'm also extremely happy with how the mittens came out and especially with the fit. Usually mittens either are or turn out a bit on the bigger side, but these ones fit absolutely perfectly! Even the thumb! And that's without having to do any modifications too! I really enjoyed knitting these up, that I'm thinking of knitting a few more pairs to have in my "gift drawer"...you know, when you need a last minute gift and don't really have the time to go out and try to find anything. 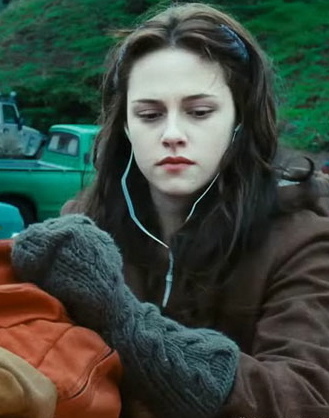 So where in the movie can you spot these mittens? In the school parking lot van accident scene where Tyler's van is skidding out of control and is about to hit Bella...that is, until our dear Edward comes jumping out from nowhere and saves her from being crushed. 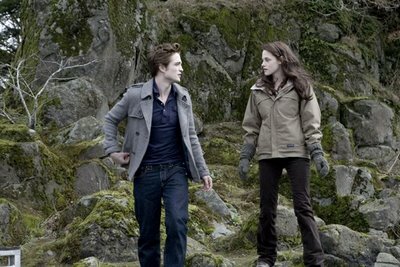 There is also another scene that very quickly shows a glimpse of the mittens, and that scene is where Bella and Edward are making their way to the river's edge. There, Edwards talks about being a "vegetarian", his mind reading abilities, and Alice's special ability. If you can't knit and really want a pair of these mittens, you can purchase a pair from the original creator, Ruth Cross, here. But I must warn you, from the looks of it, they are always sold out! I'm sure if you poked around on either etsy or eBay you'll find a replica pair. Now that the weather is sooo much chillier than it was when I had knitted these up, I'm excited to finally be able to wear them. They are so toasty warm, and the length works brilliantly with all the 3/4 length sleeved coats that I seem to can't get enough of, since the mittens are almost elbow length on me. I'm sure I'll be sporting these bad boys while on my way to the theater to see New Moon! I'm so glad to hear that this pattern is not hard. 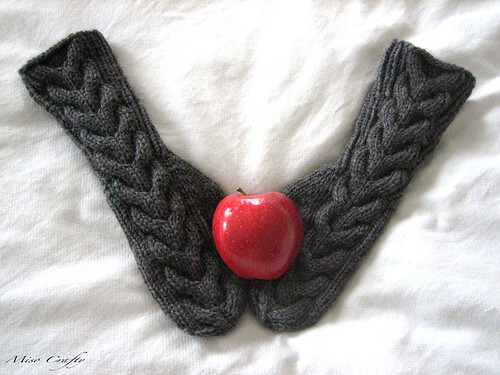 I have had them in my ravelry queue for a while but had not done them because I was a little intimidated. 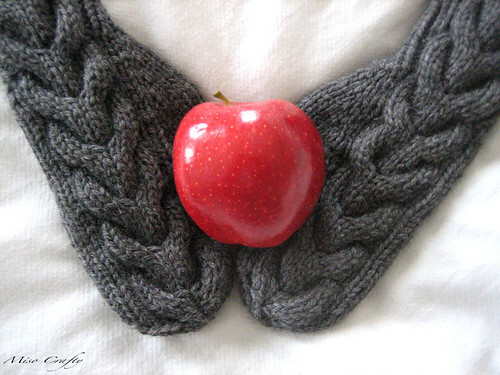 Now I have some wool that would be perfect so I think as soon as it starts getting a little cooler here I will have to make these. They look lovely! And yes, you should be able to get another set out of your leftover yarn. I used one skein of the same type in Deep Olive single-strand for my sister who wanted slimmer mittens. There's still 10 oz or so leftover. Patons really is the best yarn! The Shetland Chunky style in single-strand offers the chunky look too. I just love Patons! Great job on your Bella's mittens! Thank you so much! And thanks for letting me know that I can get another pair out of my leftover Classic Wool! I really hate it when I have so much left over yarn from a project and don't know what to do with it!